Thank you for your application a lot. MIZUNO Corporation, Duskin Co., Ltd., Daiwa House Industry Co., Ltd., Hisamitsu Pharmaceutical Co., Inc., Coca-Cola West Co., Ltd., SEIKO HOLDINGS CORPORATION, KANSAI UNIVERSITY, Ltd., The Yomiuri Shimbun, Advance Create Co., Ltd. , The Dai-ichi Life Insurance Company, ASAHI BREWERIES, LTD., KNT Co., Ltd, Photo Create, NIPPON EXPRESS CO., LTD., Toyota Motor Corporation, Sumitomo Electric, Industries, Ltd., Iwatani Corporation, KOSMO SECURITY SERVICES CO., LTD., Nisshin Seifun Group. FM802, imuraya group co., ltd., KOBEYA BAKING CO., LTD., SWAC Co., Ltd., Aoki shofuan Corporation, Hyogetsudo Co., Ltd., The Kishu Tanabe Ume Promotion Committee, EZAKI GLICO CO., LTD.
Start: Osaka Castle Park Finish: Osaka City Hall. 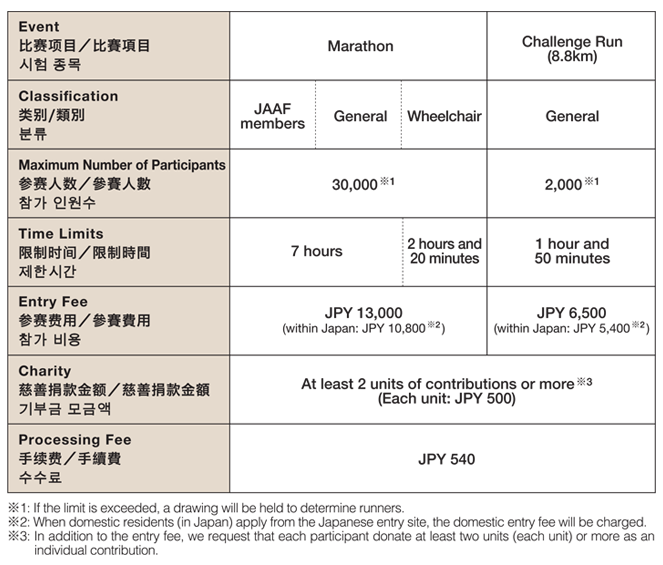 ※Registration on race day （Sun., Nov. 26, 2017） is not acceptable. ※Registration by proxy is not acceptable. Please ensure that a runner him/herself comes to the registration. ◎The top eight male and female finishers overall will receive commendations respectively. ◎The top eight male and female wheelchair athletes will be respectively commended. ◎The top three male and female runners per five-year age bracket will be respectively commended. ※Award certificates will be sent at a later date. There will be no commendation.. The charity runner having raised the most donations will be commended.